Queens Park Rangers' Josh Scowen and Sheffield United's George Baldock in action during the game during the Sky Bet Championship match at Loftus Road, London. 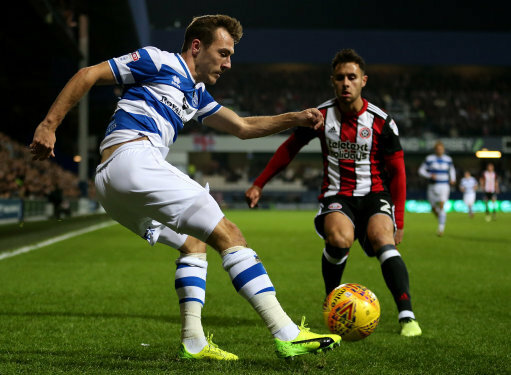 After some superb performances and results, it was maybe one game too many as a tired Blades side never quite got going at Loftus Road as the home side made it two impressive wins against high flying sides. A freak early goal from Idrissa Sylla saw off United who did not score for the first time since September 16th against Norwich at Bramall Lane. Manager Wilder made one enforced change with Lundstram coming in for the suspended Fleck but he also made other tweaks with maybe one eye on Saturday’s game against Hull and the effort the team having put in recent weeks also playing a part. In came Donaldson for Sharp and Brooks for Duffy. Hanson and Stearman were on the bench. There was no place in the match day squad for Jake Wright. United kicked away from their 1,800+ contingent in the upper tier behind Jamal Blackman’s goal. Rangers flew out of the traps and pinned United back early and had half an opening down the right but even they could not believe their luck when the visiting keeper Blackman made an absolute howler gifting them the lead. It was an innocuous through ball but the keeper dithered at first but then rose high to take it relatively unchallenged although Carter Vickers was close by but as Blackman landed he fell awkwardly and the ball fell loose. SYLLA simply tapped it in as the keeper lay in a heap on the floor seemingly badly injured. So it proved after over five minutes of treatment he had to leave on a stretcher. It was difficult to tell if it was his shoulder or back but he was clearly in real discomfort. On came Simon Moore for his first appearance of the season. He was given an excellent reception from the visiting fans. United had not got going but good work on the left saw the ball come over from Coutts but O’Connell fired over with the goal at his mercy. It was a poor miss. Moore was soon in the action as a poor clearance from Carter Vickers saw Sylla try an audacious lob. The keeper back pedalled and did enough to keep it out as his momentum almost took him over the line. Washington nearly got in after Baldock dithered and then Freeman had an effort blocked. Rangers were competing and winning a lot of 50/50 balls. They bravely had three up top and the ball over the top turning the United defence was causing problems. United were sloppy in possession and Donaldson and Clarke were too far apart when it went forward. The main threat was from Stevens down the left and he nearly combined twice. Brooks twice got shoved to the floor but referee Stroud gave nothing and was clearly was giving him no protection at all. Minimal contact the other way was given as the inconsistency was there for all to see. Stevens did really well and linked with Brookes who put over a great cross but Clarke smashed over. He really should have scored. Indeed as poor as United had been they had missed two great chances. Sylla had another chance and then Washington almost got in again as United were looking shaky at the back. Still another chance fir United came when Stevens put in a great cross and Clarke was denied at the near post by Smithies. The half time whistle came soon after that. United had lacked fluency first half and a series of giveaways summed u the performance Both Lundstram and Coutts were sloppy in possession and nearly led to Rangers breaking twice. A half chance saw Brooks fire over from the edge of the box but then Freeman and Sylla nearly got in. The latter headed over when well placed after United failed to deal with the cross. Wilder made his first outfield change with Sharp coming on for the disappointing Donaldson. He was involved instantly when Brooks nutmegged a defender to give Stevens a chance to cross. However Sharp’s shot on the angle lacked power. Luongo fired wide as both teams were now tossing away the ball. Twice miscommunication saw United give it away and then Coutts also telegraphed two balls but QPR could not capitalise. Another change came when Baldock pulled up and had to hobble off with Duffy coming on. Basham went to right back and United had a more orthodox 4-4-2. Sharp was played in by Duffy but was adjudged to be offside as Clarke put the ball in the net. Mackie came on for QPR as the game entered the final ten minutes. United were struggling to create much and Rangers crowded the midfield. United were now starting to run out of ideas with Sharp and Coutts sloppy passes again seeing two attacks break down. Scowen pulled Brooks back and the United man pushed him as he tried to take a quick free kick. The ex Barnsley man went down as if he had been shot. Both players were booked. Brooks had probably had enough of being kicked pillar to post but the referee had not protected him all game. The referee deemed there would be of four minutes of additional time to be played. Thos after 5 subs and numerous moments of blatant timewasting. United could not fashion any more chances and Rangers defended well and did enough to just about deserve the win. United – After some terrific performances of late; we were not at it today. We missed Fleck and changed things round a bit and it did not quite work. It happens. Not going to pan the manager or team. How can I? We are still in a great position and go again Saturday. They put our defenders under pressure by making them turn the other way. This is something they have not been used to. When we did have it we were too slow to move it and the ball rarely stuck up to with only Clarke a threat all game in this sense. The players who came in did not really do it but even solid players who are regulars made so many mistakes. We met a side who played very direct and went 3 up top and had a go at us. They could have scored 3 or 4 first half but we missed 2 bad ones too. Second half I felt we would improve and we had a lot of the ball but cannot recall too many clear chances save for a weak Sharp effort, an offside goal and a speculative Brooks shot. We got into some decent positions but we never got enough crosses in of quality and the final ball was poor. They got men behind the ball and we looked a bit bereft of ideas. We looked to Brooks and Duffy but even those two were often too far from goal to make anything happen. We did not make their keeper make a save of note all night except a couple of weak efforts from Clarke and Sharp. They actually had far more efforts all game and probably looked more like scoring again than we did of levelling. It sort of petered out in the end and we had no real shaped or pattern as they did enough to break up play and get bodies in the way. We were not really helped by an awful referee who gave us nothing all night. An assistant who could not wait to get his flag up for offside but missed the ball going out by a yard twice. Still to blame officials would be wrong. We met a team who actually got the better of us tactically and even outworked us at times. We could not say we deserved anything really sadly. We now have a few injuries and one potential long term one in Blackman. We have to regroup and get back to standards of previous games. Tonight showed when he changes the side there is a drop off and we need to go back to the same side (Moore apart) that got us getting such good results. Fleck, Duffy and Sharp were badly missed and even though those two came on we were chasing the game. QPR – Had two tremendous results this week after a very ordinary start to the season. Not far off the bottom places last year and I feared with the debts/players lost; they might get sucked into a relegation scrap. However, Holloway has managed to get those two big results and get them into the top half. Today they played well. They were committed and matched our energy but also looked a goal threat. They were direct and played a lot of balls down the channels and over the top but it worked. They defended well too and I felt they saw us off quite comfortably in the end. They may have expected a tougher game. Holloway has been about a bit but QPR seems to be his club. He seems well suited to them and after a few years of lavish spending and some time in the top flight; is probably the right man for their current predicament. They have wasted a lot of money in recent years and are still trying to recover from this. Although most of the big earners have now finally gone; they now have a squad that is a bit of a mish mash of experience, some young players and a few talents who could keep improving like Luongo, Bidwell, Freeman and Washington.